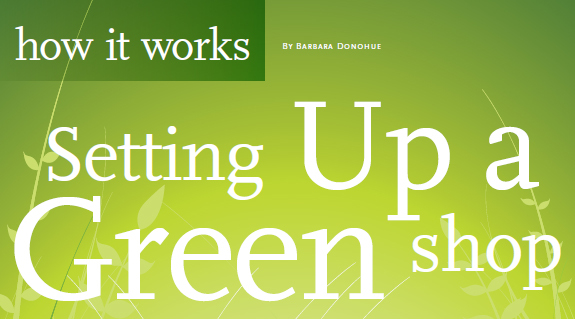 Can a machine shop be green? Yes, it can. In business or manufacturing, being green means using a minimum of energy and material, throwing away as little as possible, and making sure what you do throw away won’t harm the environment. A machine shop can certainly do these things. New Hampshire Ball Bearings, Inc. (NHBB), Peterborough, N.H., is a prime example of a company which aspires to do business the green way. With the wholehearted support of its Japanese parent company Minebea, this manufacturer of roller and ball bearings for civil and military aerospace applications is committed to sound environmental management and has participated in the Environmental Protection Agency’s Performance Track program since it began in 2000. The Performance Track program recognizes top environmental performance in many areas, including some that are not currently regulated, such as energy use and water consumption. “It’s really going above and beyond compliance,” says Patti Carrier, environmental and facilities manager at NHBB. Yes, a company can take environmentally friendliness beyond compliance with state and federal regulations. Before building your green shop, have in mind your goals for environmental standards and the strategies you will use to achieve them, whether they be conserving energy on the line or minimizing the amount of paper used in the office. A formal “environmental management system” for your new shop can help clarify and focus your efforts. Many companies seek certification to ISO 14001, the international standard for environmental management systems. From the ground up, to create a truly green machine shop, you need to start with a building designed for energy efficiency and constructed of materials that are recycled or can be reused in the future. It needs to be sited so it can take advantage of the sun for light, and, in cold climates, for warmth. It also needs to be well-insulated and have the most efficient heating and cooling systems possible. Plan landscaping to shelter the building from the prevailing winds and perhaps to provide shade from the summer sun. Plants need to be drought-tolerant, pest-resistant and able to flourish without the use of chemical fertilizers or pesticides. Your location should be as near to the homes of your labor force as possible to minimize the fuel your employees burn on their commute. Maybe you can work out a four-day work week or stagger work hours. Perhaps your employees can take public transportation. Perhaps you can help them set up carpooling or create company-sponsored vanpools. Insulation helps keep your building warm in the winter and cool in the summer. Another summertime energy saver is an “economizer” air-conditioning system. The economizer controller senses indoor and outdoor air temperatures. When the outdoor air is cooler than the indoor air, the control automatically brings in outdoor air instead of continuing to cool the indoor air. In a temperate climate, this can bring down energy usage during the summer. The HiTech Division of New Hampshire Ball Bearings. Your building should have windows and skylights to provide natural light, but you’ll need additional illumination, and it needs to be as energy-efficient as possible. Nowadays, compact fluorescents are the fixtures of choice. Install controls and occupancy sensors to turn the lights down when they’re not needed. In the recently constructed 11,000 square-foot heat-treating room at NHBB, the furnaces are painted a pale, putty color and the floor is finished with a bright white epoxy. These reflect the light so well that the 8-tube compact fluorescent light fixtures need to illuminate only six of the tubes. Lighting up all the tubes makes the room too bright, Carrier says. She will take that into account when planning new lighting in another area of the plant. Metal doesn’t get cut unless there’s a motor involved. All the motors in your green shop should be as efficient as possible to minimize electric usage. Premium-efficiency motors do exist, and, naturally, they are more expensive than conventional ones. But here’s where you can make an ideal-world choice in the real world. “The D.O.E. (Department of Energy) will pay the difference between (the cost of) a normal motor and a high-efficiency motor,” says Carrier (see sidebar). 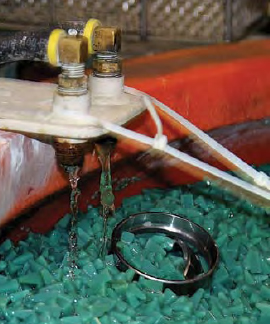 Using recycled water in tumbling operation with bearing rings at the HiTech division of New Hampshire Ball Bearing. You don’t have to dispose of cutting fluids and cleaning solvents if you don’t use them, so in your green shop try to limit their use. Wherever possible, plan your process around dry machining technology or one of the technologies that uses very small amounts of lubricant (see “How it Works” next month). You will still need to clean parts, but in your green shop, the first choice for cleaning will be water-based (aqueous) cleaning; a wash, rinse and dry process. To minimize the amount of water you use and the amount of wastewater you generate, you will want to include a water recycling system. In one such system, the soapy, oily wash water goes through a membrane system to remove the oil, leaving soapy water. This passes through a nano-filter, and the resulting clean water is then re-used within the plant. Sometimes water won’t do the trick; but remember, solvents not only create waste disposal problems, they also evaporate and can cause your plant to exceed air pollution limits set by environmental agencies. If you do need solvent cleaning, you can minimize the waste and pollution concerns by installing a self-contained unit such as the Dürr Ecoclean system, available from Edge Technologies, Inc. Developed to comply with stringent European environmental codes, Ecoclean systems use isoparaffin, a non-chlorinated hydrocarbon, in a closed cycle to remove grease and debris from parts. Removing oil: the first stage of water recycling at the HiTech division of New Hampshire Ball Bearing. Batches of parts are loaded into a basket or rack and placed in the Ecoclean. The system immerses the parts and agitates them to clean and degrease them. The system then removes the parts from the fluid and pulls a vacuum to completely dry them. Finally, the system filters and distills the cleaning fluid, making it ready to reuse. In the process, it separates out the oil and particulates, which you will remove periodically. This type of system comes in different models suitable for different sizes of parts and the throughput capacity required. Each is housed in a large, rectangular enclosure and recycles the fluid in the same way. In some cases, less toxic or hazardous materials can substitute for more hazardous ones. For example, in your new passivation line, you can use citric acid, a non-toxic substance used in food products, instead of the traditional nitric acid. After machining, iron remaining on the surface can rust. Passivation removes this free iron. Processes specifically designed for use with citric acid can cut cycle time, as well as save money on hazardous waste treatment and disposal. 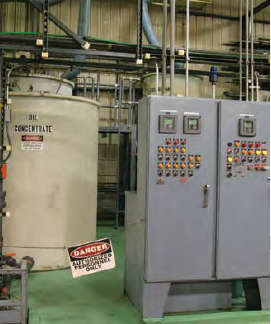 The citric acid passivation process at NHBB is approved for Defense Department components, and saves the company more than $100,000 annually, compared to the previously used nitric acid process, Carrier says. Your solid waste stream includes not only the masses of chips you produce, but also the boxes and other packaging you have to throw away. In a way, the packaging you use to ship the final product is also part of your waste stream, though your customer has to dispose of it. Look carefully at what your products really need for protection when inside your plant, when shipped between your plant and subcontractors and when sent to the final customer. Work with your suppliers and subcontractors to minimize wasteful packaging. For example, parts destined for the plating shop may be able to travel in the same plastic totes you use inside your plant. Even the front office is fair game for greening. Be sure to select computers, copiers and other office equipment that carry the Energy Star rating. This equipment usually includes a low power standby state and other energy-saving features. Computer systems have the power to reduce the amount of paper used in your plant, but it takes some planning and sometimes development of customized software to make your processes truly paperless. Investigate systems that have worked for others (see “Assembly & Innovation,” TMW, January 2006) and come up with your own, if necessary. Consider creating a purchasing policy that includes buying recycled paper and other products whenever possible. You can calculate the environmental impact of your paper choices at www.papercalculator.org. The environment. We all live in it, and so will our children and grandchildren. With planning, common sense and the latest technology, it’s possible to build and run a successful machine shop while still respecting and caring for the world around us. Ideally, “green” is designed into the building and the process, but there are still plenty of ways you can make an existing shop more environmentally friendly. Many of the same energy saving strategies you use at home can work just as well at your place of business. You can often find rebates from your utility companies, and there are state and federal tax incentives for improvements you make. They use less energy than conventional counterparts and last nearly forever. What are they? Compact fluorescent lights, of course. You may have them at home, but you should also consider installing them in the shop. Sizes and styles are available to replace a wide range of incandescent bulbs. Besides lowering your electric bill, the compact fluorescents generate less heat, so the plant stays cooler in the summer. As you look to install new motors or replace motors, consider installing premium-efficiency models. Yes, they cost more, but regional programs, such as Motor Up, provide rebates to pay the difference in cost between a standard motor and its premium-efficiency counterpart. And you gain the savings on your electric bill – as much as $300 per year running a 20-hp motor continuously at full load, according to Motor Up figures. A closed-cycle cleaning system may be beyond your means, but you can reduce the amount of mineral spirits you need to buy for degreasing, as well as reduce or eliminate disposal cost for waste solvent. A system like the Pro Clean Solvent Center from Genesis On-site Recycling in Gary, Indiana, distills dirty solvent, making it clean again so you can use it over and over. Where does all the heat go? Most utility companies offer free or low-cost energy audits for businesses. You may think that your building is nice and tight and that your mechanical systems are working well, but it wouldn’t hurt to have a professional evaluation of your building envelope and heating/cooling system. Take advantage of this service and make some of the high priority improvements the audit recommends. Making your shop greener can help you “do well by doing good.” You’ll be doing the right thing for the environment, and you’ll save money at the same time.